Zelaya's delegates say they reject the San Jose Accord, call Micheletti "intransigent"
TEGUCIGALPA, Honduras (CNN) -- An agreement to end the monthlong political turmoil in Honduras went before Congress, with political amnesty and national elections on the table. The 128 deputies of the country's unicameral legislature will decide whether to grant a period of political amnesty for both sides in the conflict, and whether to move forward the national elections scheduled for November. The two issues are among the points included in the so-called San Jose Accord -- a proposed agreement to bring an end to the political standoff that escalated after the ouster of President Jose Manuel Zelaya on June 28. The United Nations and Organization of American States condemned the coup that pushed Zelaya out of the country and have called for his reinstatement as president. But Roberto Micheletti, who was named president by the Honduran Congress after Zelaya was deposed, has argued that the actions of that day -- when the military forcibly entered Zelaya's home and transported him out of the country -- was not a coup, but a constitutional transfer of power. Micheletti appealed directly to critics in an op-ed published Monday in the Wall Street Journal, expressing support for the mediation efforts leading to the San Jose Accord, which neither side has signed. 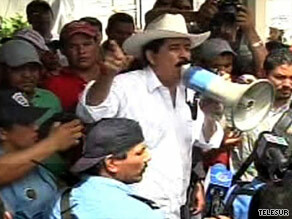 "The way forward is to work with Costa Rican President Oscar Arias," he wrote, referring to the mediator of the talks. Micheletti has not signed the document either, because some of its proposals -- including holding early elections and granting a period of amnesty -- require the other bodies of government to approve. The ongoing Congressional debate could have a large impact on the future of the agreement. The Honduran military over the weekend signaled that it would support a resolution to the crisis, as long as its implementation was ruled constitutional. The supreme court has said it would not support Zelaya's return as president, one of the accord's key points, but has not issued an opinion on the latest proposal. Journalist Elvin Sandoval in Tegucigalpa, Honduras, contributed to this report.